My compliments to the lady of the household, beautiful work! Mark: It’s good to have an old-fashioned woman in a fresh chassis. I am appalled at this sexism! Appalled, I tell you. Beautiful. A woman of many talents. Connie: Quite true, and her greatest talent, from my perspective, was her ability to pick me. Beautiful work. I would say it is petit point rather than calling it embroidery. Petit point is very fine, detailed work usually done by counting from a graph like picture. My mom did lovely petit point work also. Please give her my compliments on her work. Brenda: Petit point it is then. What do I know? It all looks like embroidery to me. I shall deliver your compliments. Thanks. She tells me it’s called punto de cruz down here. Ok, thanks, then it is cross stitch rather than petit point. Whatever, it is very lovely and time consuming to do. Brenda: It’s all embroidery to me. Cross stitch. I could buy a ton of the finished pieces for sale! I try to restrict myself to pieces I can display at home but it’s very hard to make choices. 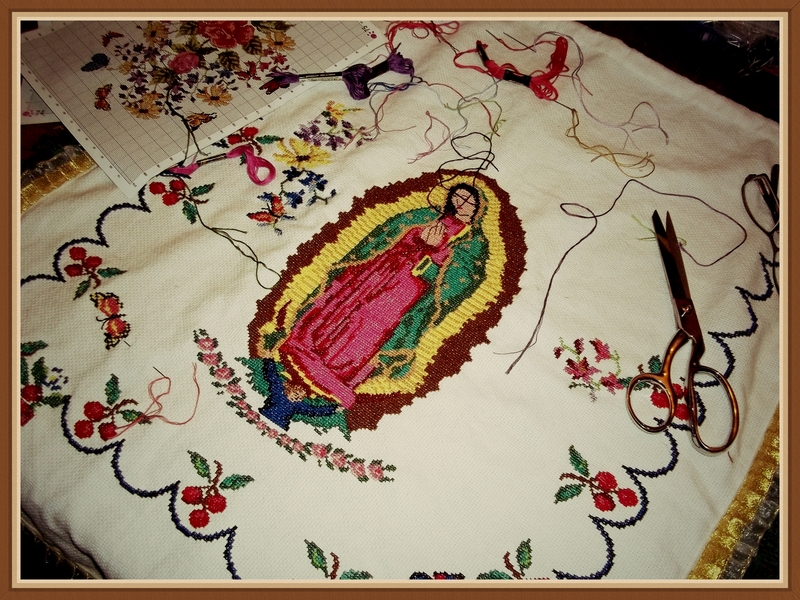 Yes, handmade embroidery/cross stitch is a disappearing art in the commercial marketplace. Hecho a mano is so much more classy! Carole: And my talented spouse is quite classy!